One of the first steps in diagnosing lung diseases is differentiating between obstructive lung disease and restrictive lung disease. While both types can cause shortness of breath, obstructive lung diseases (such as asthma and COPD) cause more difficulty with exhaling air and restrictive lung diseases (such as pulmonary fibrosis) can cause problems by restricting a person's ability to inhale air. It’s a difference that might not be apparent at first, but one that can be differentiated by a battery of diagnostic tests that evaluate the capacity and forcefulness of a person’s breathing. Though there are many different obstructive and restrictive lung diseases, there are some major characteristics that differ between the two. Obstructive lung diseases are characterized by an obstruction in the air passages, with obstruction defined by exhalation that is slower and shallower than in someone without the disease. Obstruction can occur when inflammation and swelling cause the airways to become narrowed or blocked, making it difficult to expel air from the lungs. This results in an abnormally high volume of air being left in the lungs (increased residual volume). Increased residual volume, in turn, leads to both the trapping of air and hyperinflation of the lungs—changes that contribute to a worsening of respiratory symptoms. In contrast to obstructive lung diseases, the restriction is defined by inhalation that fills the lungs far less than would be expected in a healthy person. Restrictive lung diseases are characterized by a reduced total lung capacity or the sum of the residual volume mentioned above combined with the forced vital capacity (the amount of air that can be exhaled forcefully after taking a deep breath). This occurs because of difficulty filling the lungs completely in the first place, and can be due to intrinsic factors (e.g. stiff lungs); extrinsic factors, such as when pressure from an enlarged abdomen limits the expansion of the lungs; or neurological factors, such as muscular dystrophy, where damage to the nervous system interferes with movements necessary to draw air into the lungs. There are both similarities and differences between obstructive and restrictive lung diseases with regard to symptoms, and these signs can also differ between the specific diseases in these categories. That said, there can be significant overlap in symptoms, and pulmonary function tests are often needed to make a diagnosis. With obstruction, a person may have difficulty expelling all of the air from the lungs. This often worsens with activity, since when respiratory rate increases, it becomes challenging to blow out all of the air in the lungs before taking the next breath. Narrowing of the airways may cause signs such as wheezing, and many of the conditions that fall under the category of obstructive lung disease are associated with increased sputum production as well. With restrictive lung disease, a person may feel like it hard to take a full breath, and this can cause considerable anxiety at times. With extrinsic lung disease, a person may change positions trying to find a position that makes it easier to breathe. Shortness of breath, or the symptom of difficulty breathing called dyspnea, is common with both obstructive and restrictive lung diseases. Early on in the course of these diseases, dyspnea may occur primarily with activity, with symptoms at rest occurring in the more advanced stages. Other symptoms that are common with both include a persistent cough (though this is more common in conditions such as bronchitis and pneumonia), a rapid respiratory rate (tachypnea), anxiety, and unintentional weight loss (due to the increased energy needed to breathe). Lung conditions can be broken down into those that are primarily obstructive and those that are primarily restrictive, though some people may have one or more conditions that fall into different categories (mixed). With some lung diseases, the condition causes one pattern early on and a different pattern later. Among restrictive lung diseases, these can further be broken down into intrinsic and extrinsic restrictive disorders. A person may also have symptoms and tests that suggest a combination of obstructive and restrictive disease, for example, when a person has both COPD and pneumonia. In addition, some diseases, such as silicosis, cause an obstructive pattern in the early stages of the disease and a restrictive pattern when the condition is more advanced. Making a diagnosis of either obstructive or restrictive lung disease begins with a careful history and physical exam, though pulmonary function tests and imaging tests are very important, especially when the diagnosis is unclear. These tests can also sometimes help doctors understand if more than one condition is present at the same time, especially when a mixed pattern is found. Forced vital capacity (FVC): Forced vital capacity measures the amount of air a person can breathe out forcefully after taking as deep a breath as possible. Because lung capacity is reduced in both obstructive and restrictive diseases, the FVC alone cannot diagnose either disorder. Forced expiratory volume in one second (FEV1): Forced expiratory volume in one-second measures the total amount of air that can be forcibly exhaled in the first second of the FVC test. Healthy people generally expel around 75 percent to 85 percent in this time. The FEV1 is decreased in obstructive lung diseases and normal to minimally decreased in restrictive lung diseases. FEV1/FVC ratio: The ratio of FEV1 to FVC measures the amount of air a person can forcefully exhale in one second relative to the total amount of air he or she can exhale. This ratio is decreased in obstructive lung disorders and normal in restrictive lung disorders. In an adult, a normal FEV1/FVC ratio is 70 percent to 80 percent, and in a child, a normal ratio is 85 percent or greater. The FEV1FVC ratio can also be used to figure out the severity of obstructive lung disease. Total lung capacity (TLC): Total lung capacity (TLC) is calculated by adding the volume of air left in the lungs after exhalation (the residual volume) with the FVC. TLC is normal or increased in obstructive defects and decreased in restrictive ones. In obstructive lung diseases, air is left in the lungs (air trapping or hyperinflation), causing the increase. Diffusing capacity (DLCO) is another measurement that can be helpful in narrowing down a diagnosis. DLCO measures how well oxygen and carbon dioxide can diffuse between the tiny air sacs (alveoli) and blood vessels (capillaries) in the lungs. The number may be low in some restrictive lung diseases (for example, pulmonary fibrosis) because the membrane is thicker and low in some obstructive diseases (for example, emphysema) as there is less surface area for this gas exchange to take place. Lab tests may give an indication of the severity of lung disease, but are not very helpful in determining if it is obstructive or restrictive in nature. Oximetry, a measure of the oxygen content in the blood, may be low in both types of diseases. Arterial blood gases may also reveal a low oxygen level and, sometimes, an elevated carbon dioxide level (hypercapnia). With chronic lung disease, hemoglobin levels are often elevated in an attempt to carry more oxygen to the cells of the body. 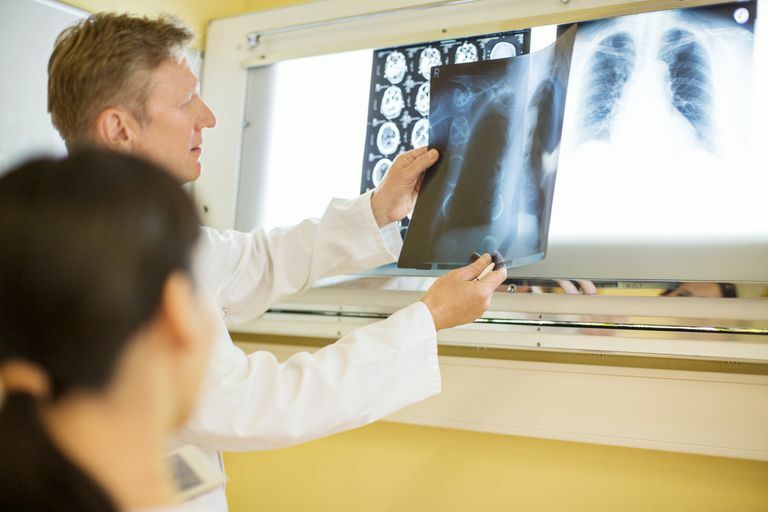 Tests such as chest X-ray or chest computed tomography (CT) scan may give clues as to whether a lung disease is obstructive or restrictive if the underlying condition (such as pneumonia or a rib fracture) can be diagnosed. Bronchoscopy is a test in which a lighted tube with a camera is threaded through the mouth and down into the large airways. Like imaging studies, it can sometimes diagnose the underlying condition. The treatment options are significantly different for obstructive and restrictive lung diseases (though treatments can vary considerably depending on the particular condition). With obstructive lung diseases such as COPD and asthma, medications that dilate the airways (bronchodilators) can be very helpful. Inhaled or oral steroids are also frequently used to reduce inflammation. Treatment options for restrictive lung diseases are more limited. With extrinsic restrictive lung disease, treatment of the underlying cause, such as a pleural effusion or ascites, may result in improvement. With intrinsic restrictive lung disease such as pneumonia, treatment of the condition may also help. Until recently, there was little that could be done to treat idiopathic fibrosis, but there are now drugs available that can reduce the severity. Supportive treatment can be helpful for both types of lung diseases and may include supplemental oxygen, noninvasive ventilation (such as CPAP or BiPAP), or mechanical ventilation. Pulmonary rehabilitation may be beneficial for those who have COPD or who have had lung cancer surgery. When severe, lung transplantation is also sometimes an option. The prognosis of obstructive vs restrictive lung diseases depends more on the specific condition than the category of lung disease. With obstructive lung diseases, those that are reversible often have a better prognosis than those that are not. It can be frustrating if you are thought to have a lung disease but your doctor isn't certain the exact diagnosis, and waiting for the results of tests and studies can cause considerable anxiety. Fortunately, there are many clues doctors can use to separate out obstructive from restrictive lung diseases—a distinction that is important in order to select the best treatment options available. McCormack, M. Overview of Pulmonary Function Testing in Adults. UpToDate. Updated 02/07/18.